Sometimes you want to be seen but don’t require the use of regular high-visibility clothing. Something that is lightweight, practical and multi-functional would be ideal. We offer three separate products – all hi-vis and reflective – that can be used individually or together as a system. It’s your choice! Braces: These braces are fully adjustable to fit most people – XL also available. The heavy duty steel clips are guaranteed not to slip and can be used on regular pants or clamped onto a tool-belt. They can also be attached to the reflective belt to produce a full harness-like system. Belts: The High-Vis Belts can adjust from 26″ to 90″ (66cm – 230cm), enabling it to be worn in Summer (e.g., over a T-shirt) or in Winter (e.g., over a parka). A robust nylon buckle can function smoothly in virtually any environment and a side-release design makes it easy to open and close. We have incorporated a “hook and loop” breakaway feature into our reflective belt so it will open and come off should it get caught on a vehicle, machine, etc. Armbands: Not your average armband! Fully adjustable from 6″ to 18″ (15cm – 46cm), it can be snugly tightened with only one hand – unlike most others! 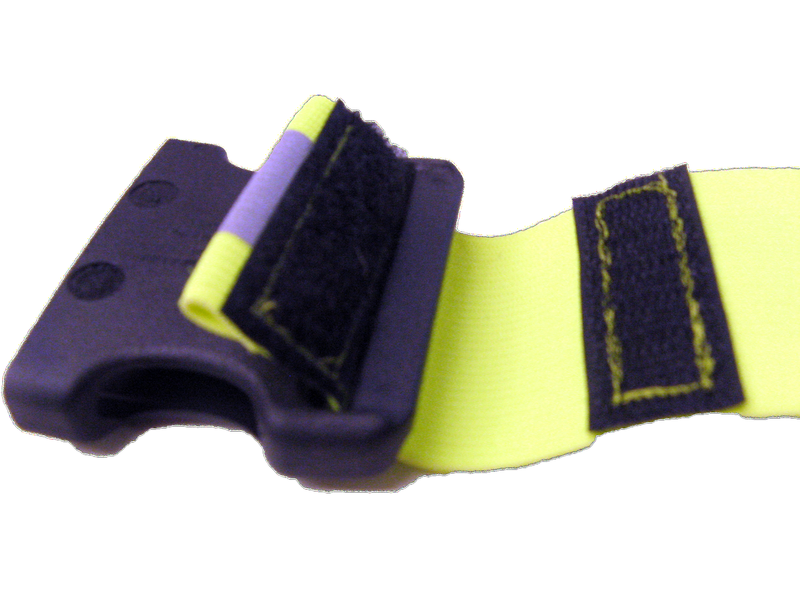 Our Braces, Belts & Arm-Bands come in two high-visibility colours: fluorescent orange and fluorescent yellow/green. All are made with high stretch 2″ (5cm) wide elastic and a 1″(2.5cm) reflective strip down the centre. There are many situations where one or all of our reflective accessories are ideal. Examples such as security, warehousing, landscaping, maintenance, construction, guiding, training, manufacturing and forestry are but a few suggestions of situations where you might appreciate the comfort and versatility of these Hi-Vis products. Because we are the manufacturer, we can customize these items to your specific needs through design, material or printing. Let us know what you want!